Q. Confession Before Communion if I Missed Mass? Q. Do I need to go to confession before taking Communion if I miss Sunday Mass due to going on vacation? A. Yes, most likely, at least an honest attempt must be made, but let’s clarify. It’s not necessarily a black and white answer. 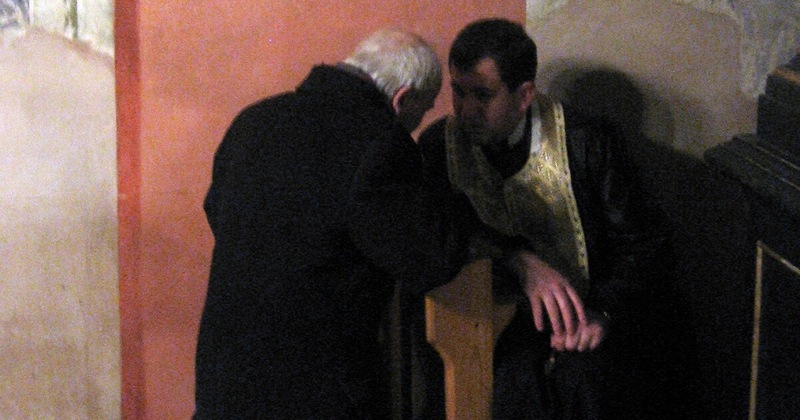 The quick answer is that if you committed a mortal sin, then yes, you should go to confession prior to receiving Holy Communion if possible. But let’s look at this in more detail. The first question is this: Have you committed a mortal sin? Well, if you did a grave action, you had full knowledge that it was seriously wrong, and you did it anyway with complete consent of the will, then, yes, you committed a mortal sin. If one of these three factors was lacking, then it may still be a grave violation of God’s law, but you may not be morally culpable for your actions (See Chapter 2 – The Law, Society, Grace and Salvation for a more thorough explanation). Is it grave matter to miss Sunday Mass? Yes it is. It’s a violation of the Third Commandment. Did you have full knowledge that this was a grave violation? This is for you to decide. After reading this you certainly do, but what about prior to reading this? What was your honest understanding? If you were ignorant of this command from our Lord, through no fault of your own, then your guilt for missing Sunday Mass may have been lessened. Did you miss the Mass with full consent of the will? For example, if you were driving there and your car broke down, you did not intentionally miss Mass. In this case, it’s not a mortal sin and may not even be a sin at all even though the Third Commandment was violated in an objective sense. What’s important to understand is that for a sin to be mortal, and therefore exclude us from receiving Holy Communion, we must be fully guilty of the action. God knows the full picture and will judge accordingly. Be honest with yourself and with God and admit your guilt when it is there. Do not be afraid to refrain from Communion if you are aware of serious sin and have not chosen to confess it yet. Refraining, in this case, is far better for your soul than going to Communion. Then the grace of the Sacrament has already begun to pour forth and you should go to Communion. The best advice to offer is to avoid mortal sin and all will be well!